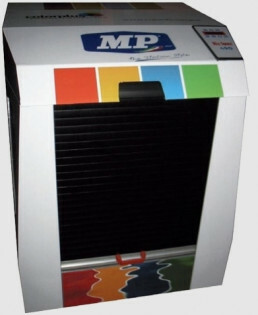 Colorplus® is MP tinting system. It has been developed by using the most advanced technology to guarantee high performance and good savings thanks to the high concentration of the pigment. The Colorplus® range offers customized solutions that meet the needs of the small retailer and hardware store, to the large distributor. It ensures a high quality service with minimum required stock and excellent colour rendering. The Colorplus® Archimede 16 is the ideal solution for small-medium sized retail or service centers, that can tint cans of paints of any size. Thanks to the new, innovative and revolutionary pump design, Colorplus® Archimede 16 is the first truly low maintenance automatic colorant dispenser resulting in the lowest cost of ownership on the market today. Colorant refilling and canister substitution is extremely easy thanks to rotating frame system, in addition, the new innovative Progressive Cavity Pump (PCP) dispensing technology can play the double role of moving a volume with precision (typical of a volumetric pump) and retain a liquid (typical of a valve), thanks to its reversibility, it solves the problem of the drying of colorants on the nozzles, each dosage ends with a small rotation backward of the pump sniffing back the colorant inside the nozzles. This in addition to the automatic humidifier cap reduces to the minimum the contact with air. The Colorplus® Archimede 16 also offers extremely high precision dispensing down to 1/1000 of a fluid ounce (0,03 ml), it also operates within a ± 1% error on average dispenses, so precise, that it can be used to tint sample color testers! In addition, thanks to material of which the pumps are made of, you only need to calibrate the machine once, during installation, the machine is also equipped with sensors that detect the can and with a manually repositionable shelf. The state of the art software is specifically designed for point-of-sale custom color dispensing and thanks to the database management system, that stores all the key information of colours and product ordered by your customers, you’re able to offer an efficient and important service. The software performs a large list of functions including: product look up, can-size specification, colorant consumption and colour database management. Colorplus® Archimede 16 is available in 2 dosing system, continuous consecutive or simultaneous. The simultaneous dosing system can dose 4 colorants simultaneously. The Colorplus® Eureka 16 is the ideal solution for medium sized retail and paint shops that need high productivity and high performance tinting system to tint volumes of paint in cans of any size. Thanks to the new, innovative and revolutionary pump design, Colorplus® Eureka 16 is the first truly low maintenance automatic colorant dispenser resulting in the lowest cost of ownership on the market today. Colorant refilling and canister substitution is extremely easy thanks to rotating frame system that allow to change any circuit in just a couple of minutes, in addition, Colorplus® Eureka 16 dispenser adopts the revolutionary dosing principle of the “Progressive Cavities Pumps” that can play the double role of moving a volume with precision (typical of a volumetric pump) and retain a liquid (typical of a valve), thanks to its reversibility, it solves the problem of the drying of colorants on the nozzles, each dosage ends with a small rotation backward of the pump sniffing back the colorant inside the nozzles. This in addition to the automatic humidifier cap reduces to the minimum the contact with air. The Colorplus® Eureka 16 also offers extremely high precision dispensing down to 1/1000 of a fluid ounce (0,03 ml), it also operates within a ± 1% error on average dispenses, so precise, that it can be used to tint sample color testers! In addition, thanks to material of which the pumps are made of, you only need to calibrate the machine once, during installation, the machine is also equipped with sensors that detect the can and with a manually repositionable shelf. 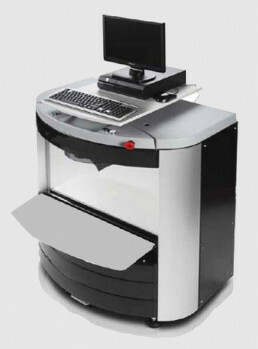 The state of the art software is specifically designed for point-of-sale custom color dispensing and thanks to the database management system, that stores all the key information of colours and product ordered by your customers, you’re able to offer an efficient and important service. The software performs a large list of functions including: product look up, can-size specification, colorant consumption and colour database management. Colorplus® Eureka 16 is available in 2 dosing system, continuous consecutive or simultaneous. The simultaneous dosing system can dose 4 colorants simultaneously. 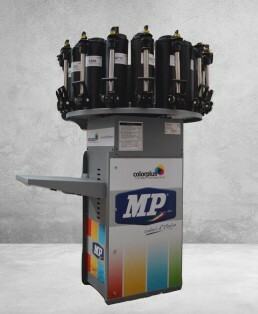 The Colorplus® Automatic Dealer dispenser, is the ideal solution for medium sized retail or service centers that need high productivity and high performance tinting system to tint volumes of paint in cans of any size. The machine is equipped with 16 and stainless steel canisters and high quality and precision Twin Ball Valve®2/5 fl. OZ, in order to obtain a high speed dispensing up to 2 liter/minute (the pumps don’t need any calibration). The nozzle cleaning system is totally automatic and uses brushes, in addition, the innovative design makes refilling an easy and quick task, in order to reduce time and increase efficiency. 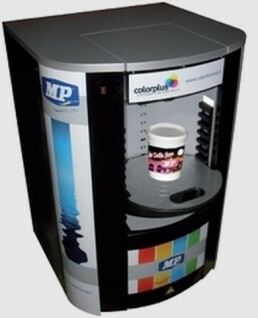 The Colorplus® manual dispenser is the ideal solution for small sized retail shops and point of sales, which need to tint drums of paint in any size. The machine has 16 canisters (2.3 litres capacity) and 2 Oz piston pumps. The machine is also equipped with a Micro-Gauge™ for an optimized management of micro dosages and Accu-Purge™ system that guarantees good results in all dosing runs. Thanks to the user-friendly design interface, maintenance is reduced to minimum. Colorplus® Mixer 1 is an automatic 5 speed biaxial gyroscopic mixer, with automatic clamping and can repositioning. The shelf is completely extractable for an easier can loading. It’s the ideal solution to mix cans of paint of any size, and, it can also mix more than one small cans at the same time. Excellent performance with high viscosity paints such as lime based, stuccos, plasters or exterior wall coatings. 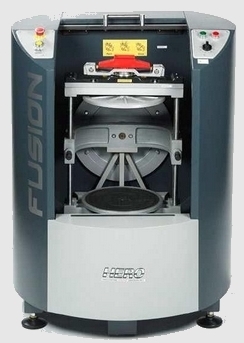 It can load cans of paint up to 40 Kg and maximum dimensions 490 mm height x 380 mm diameter (minimum can height 80mm). The machine is also equipped with a sensor that automatically stops the machine in case the front door is opened. Colorplus® Mixer 1 is easy to use thanks to the user friendly digital display that controls speed, timing and clamp distance. Colorplus® Mixer Semi-auto is a gyroscopic semi-automatic mixer, with manual clamping and can repositioning at the end of the cycle. The shelf is completely extractable for an easier can loading. It’s the ideal solution to mix cans of paint of any size, and, it can also mix more than one small cans at the same time. Excellent performance with high viscosity paints such as lime based, stuccos, plasters or exterior wall coatings. It can load cans of paint up to 35 Kg and maximum dimensions 430 mm height x 380 mm diameter. Colorplus® Spectrum DRS RM6 is a portable sphere spectrophotometer that provides versatile, fast and accurate color measurements. It’s the ideal solution for retails and colour centers that need to supplement the tinting machine with an instrument that can read, formulate and check colours. 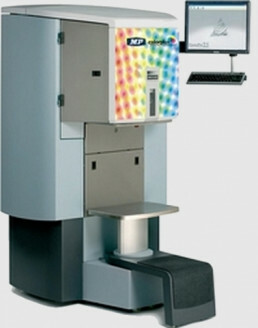 The spectrophotometer provides accurate color data measurements thanks to the exclusive Dynamic Rotational Sampling technology with Sphere Spectralon® D/8° geometry, eliminating color-chip guessing. The light source is provided by a tungsten lamp and the spectral range goes from 390 to 710 (±10) nanometers. The portable spectrophometer is supplied with rechargeable batteries and Xrite MG formulating software. The software includes the possibility to calculate the formula according to the priority selected (Δe, metamerism, spectrophotometric curve, color correction, cost, hiding power). There is also the possibility to calculate the colour correction automatically when adding a new formula or when editing an existing one and you can simulate manually the desired correction. The software allows the possibility to add a new formula and compensate automatically for gloss whenever there is a gloss difference between the standard and sample, in addition, the software search its database for the closest formula that matches the desired colour. A PC or laptop is required since the spectrophotometer does not have a display included in the device. Colorplus® Spectrum DRS SP52 is a portable sphere spectrophotometer that provides versatile, fast and accurate color measurements. It’s the ideal solution for retails and colour centers that need to supplement the tinting machine with an instrument that can read, formulate and check colours. The spectrophotometer provides accurate color data measurements thanks to the exclusive Dynamic Rotational Sampling technology with Sphere Spectralon® D/8° geometry, eliminating color-chip guessing. The light source is provided by a tungsten lamp and the spectral range goes from 390 to 710 (±10) nanometers. 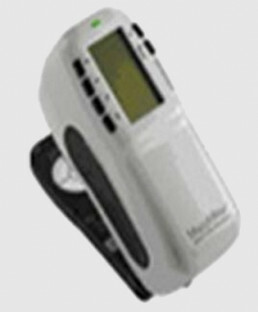 The portable spectrophometer is supplied with rechargeable batteries and Xrite MG formulating software. The software includes the possibility to calculate the formula according to the priority selected (Δe, metamerism, spectrophotometric curve, color correction, cost, hiding power). There is also the possibility to calculate the colour correction automatically when adding a new formula or when editing an existing one and you can simulate manually the desired correction. The software allows the possibility to add a new formula and compensate automatically for gloss whenever there is a gloss difference between the standard and sample, in addition, the software search its database for the closest formula that matches the desired colour. 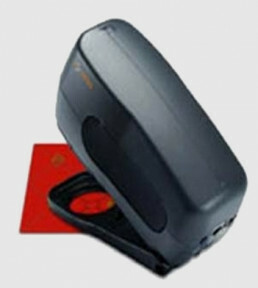 The device incorporates a wide digital display that allows the use without having to connect it to a PC or laptop, allowing a fast and reliable search. The device stores over 16,000 different colours.